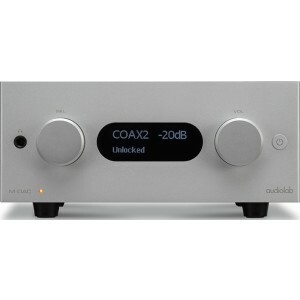 Audiolab's flagship DAC above the multi-award winning M-DAC and features DSD support via USB as well as the capability to handle high res audio upto 32-bit/384kHz. Audiolab M-DAC+ (Plus) is a step up from the award winning M-DAC, offering you the same award winning technology with several enhancements for even better performance. The new M-DAC+ is based firmly on the classic M-DAC, with carefully targeted improvements in key areas – a logical move, given the original model’s sustained popularity over the last four years. The M-DAC built a peerless reputation with press and public alike since its launch in the autumn of 2011, scooping multiple Product of the Year Awards from the likes of What Hi-Fi?, Hi-Fi Choice and EISA to make it arguably the most critically acclaimed DAC component ever made. Like the M-DAC, the M-DAC+ incorporates the ES9018 Sabre Reference 32-bit DAC chipset, still widely regarded as the finest available. This is surrounded by exceptionally well-specified circuitry that puts other similarly priced DACs to shame. It includes a proprietary, discrete master clock to minimise jitter, coupled with extensive time domain isolation. A JFET Class A output stage ensures that the audio signal, following conversion from the digital domain to analogue, is of the highest quality. Another important change relates to the power supply, which has been upgraded and is now incorporated within the M-DAC+’s chassis (hence its slightly taller and deeper case compared to the classic M-DAC). A precision-wound toroidal transformer uses multiple windings to feed separate analogue and digital rectification stages. From there, multiple power supply sections feed the necessary voltages to each area of the DAC, keeping any crossover interference to a minimum. The result is the highest performance power supply Audiolab engineers have yet specified for a DAC, and its contribution to the M-DAC+’s enhanced sonic performance is significant. I received my M-Dac Plus I put it onto my secondary system (which lies in my holidays house): the first impression was really stunning. I certainly knew Audiolab products, I was aware about the technical options they chose, the connections that gear can offer and so on: I was prepared, I thought. Just one thing I was positively not prepared for: the huge amount of musical space, the accuracy of tonal balance, the precision and the richness of the sonic texture the Dac could offer. Compared to other quite more expensive stuff I well know, such as Naim CDX2 or Metrum Acoustic Pavane DAC, the Audiolab works incredibly well and for sure I can say it is a little big bargain.